Igloo Product Corp., the number one cooler manufacturer worldwide, has introduced a new 20 quart insulated beverage server, the Party Bucket, as an upgraded alternative to traditional unlined tubs. By fully insulating the body with foam, the Party Bucket prevents the formation of messy condensate rings that are left behind by non-insulated plastic and metal beverage tubs. It’s a great addition to any hostess’s serving pieces. According to Igloo hard-sides product manager, Lisa Silva, the new Party Bucket is ideal for backyard and in-home entertaining. “We saw the need for a counter top-sized, tub-style cooler that can either be used to ice down beverages and cold snacks, or to keep your crawfish or corn on the cob warm. By fully insulating the body with foam, the Party Bucket prevents the formation of messy condensate rings that are left behind by non-insulated plastic and metal beverage tubs. It’s a great addition to any hostess’s serving pieces,” said Silva. Designed for entertaining indoors and out, the Party Bucket is lightweight and easy to clean. The insulated body keeps food and beverages cold longer than unlined tubs. The Party Bucket also has an elevated base to keep it away from hot surfaces to maximize cold retention. 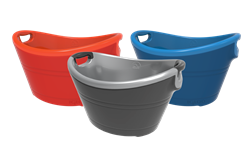 The Party Bucket is made of durable polypropylene and features a leak-resistant, triple-snap drain plug for fast and easy draining and ergonomic handles with wide grips to make carrying comfortable. Additionally, all Party Buckets are “nestable” to save space when not in use and during storage. The Party Bucket is currently available at retail in fiesta blue, fiesta orange, and a neutral dark gray/silver combination. Additional colors—purple, red and lime green—are coming soon to select retailers. The MSRP of the Party Bucket is $24.99. For further information about the Igloo 20 Quart Party Bucket or about any other Igloo product, contact Katie Davis at kdavis(at)igloocorp(dot)com. Founded in 1947, Texas-based Igloo Products Corp. is today an international designer, manufacturer and marketer of outdoor products that make the outdoor experience more accessible and fun. So whether it’s on the water, near the water, on the trail, on the hunt, in the mountains or just around the house for family fun, Igloo goes where you go and makes the experience better. For more information on Igloo, visit the company's website at http://www.igloocoolers.com.